Hi, I am ” NAKKAN” . If you came here, I will pick you up KOBE shightseeing. A big fish object is easy found from even a highway. 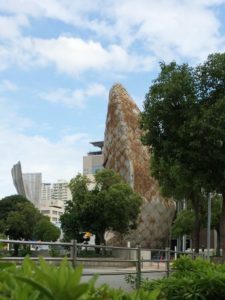 It is in the Meriken Park and a symbol of the port city Kobe. When I was a child, I believed that it might be a museum because it was so beautiful. 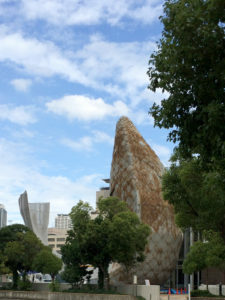 A world-famous architect, Andou Tadao designed it. The view from the fountain in front of the main entrance shows you just like a big fish splashing. A comfortable white based cafe with lots of sunshine form a stairwell has enough space to move a wheelchair. As you may see the picture, the main entrance has steps, though, there is a side entrance with a slope, you don’t need to worry! 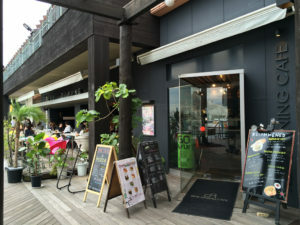 To enjoy tea and meal at a quiet cafe in the park away from bustle of a big city with a view of kobe Port is just a Kobe style. There are cute Kawaii shops in red brick warehouses nearby. 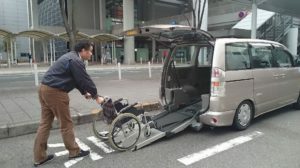 Welcome to Kansai Wheelchair sightseeing supporters. 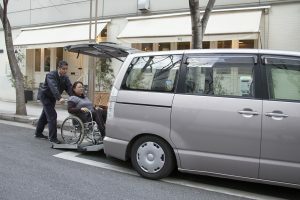 Has anyone give up to go sightseeing in Japan just because it’s hard to move without wheelchairs? We are here in Kobe, Kansai area. We have special vehicles to carry wheelchairs. We support your stay in Kansai. Kobe is a beautiful and exotic city. We have the oldest mosque in japan here in Kobe, so Muslims may feel at home. Kyoto, world famous city is close. And also, we are OK with only transportation form Kansai International Airport to hotels. Just take a look our homepage and give us contact! Nakkann, the driver who can speak little English and Chiaki,the interpreter of Japanese beauty are welcome you! 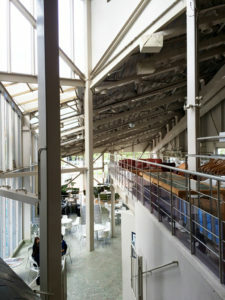 Real Dining Cafe is on the second floor of MOZAIC. This is the branch shop of Kannnonnya which is a famous cafe in Motomachi. 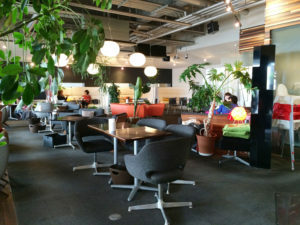 The main shop, however, is in the basement which requires to go down the stairs, we recommend this branch in MOZAIC because there is a lift to go to the upstairs. There are two rooms. One is quiet , non-smoking and inside. the other one is OK for smoking on the terrace. 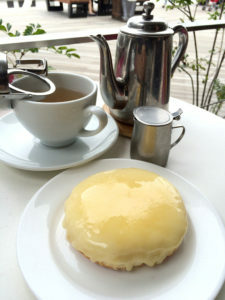 It is cool to have danemark style cheesecake with looking ships coming in and out the Kobe Port. 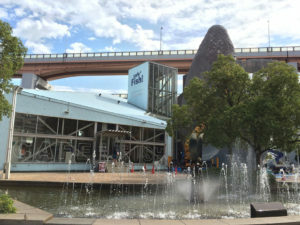 Cafe Fish has a big fish object in the garden which is one of landmark of Kobe. The scenery of the port from the windows is just Kobe. 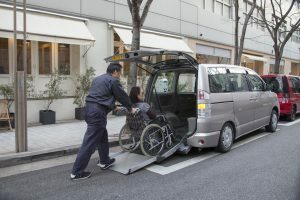 It has enough room to move on a wheelchair easily. You can enjoy the dishes used lots of foodstuff from not only Kobe but also Hyogo. 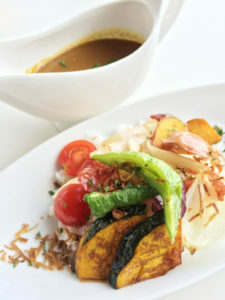 Vegetable Kobe curry is full of vegetables from Kobe. 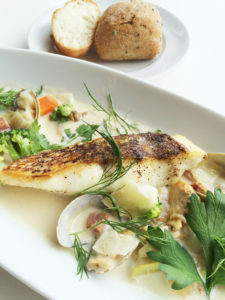 You can enjoy Poele of red seabream with clam chowder from fish and shells from Seto Inland Sea. They are very good. There is the slope to enter at side entrance to go on a wheelchair easily. 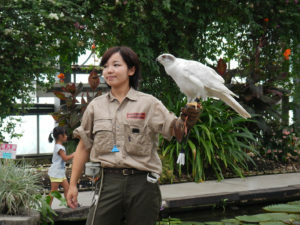 Kobe Animal Kingdom is the theme park to interact with flowers and animals. There are beautiful hanging flowers of water lilies and begonias to welcome you at the entrance. 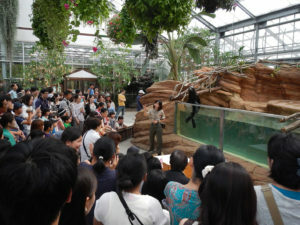 You can enjoy not only beautiful flowers，but also　playing with rare birds，capybaras and alpacas.Birds’ performance entertainments are very exiting and will attract you. The park is designed for all weather, so you don’t have to worry of rainy days. Floor is all flat, easy to move on wheel chairs. There are multiple purpose lavatories in the park. It is the best place to have fun with families and friends. 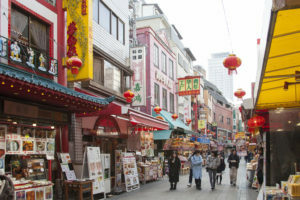 Nannkinnmachi is one of the three biggest China town in Japan.You can feel an exotic atmosphere there.There is a gazebo in the central square. They hold Shunsetusai and Chuushuusetu events in front of the gazebo. 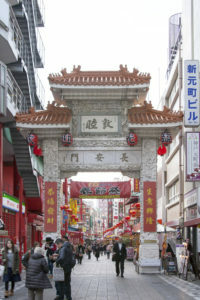 Shunnsetusai is the Spring festival to celebrate old New Year Day in the middle of February. They have a parade with Yang Guifei, the queen of old China, Zhuge Liang, a famous Chinese stateman and the first Han emperor, Liu Bei. 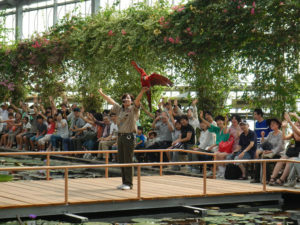 You can enjoy traditional Chinese lion dance at that time. Chuushuusetu is the autumn festival to love full moon and celebrate fall harvest. In Chinese custom, they enjoy a big dinner with round tableware like full moon at the round table with whole family on this day. They also give Geppei, moon cake to friends. Nannkinnmachi has three big gates Chouannmonn to keep east, seiannmonn to keep west and Nannroumonn to keep south. 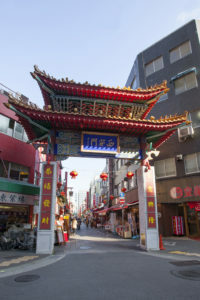 the entrance to the north is attached to Kobe Motomachi Avenue. 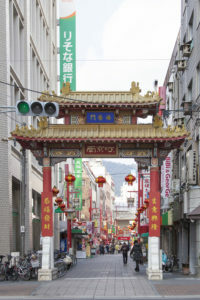 There are many Chinese restaurants. 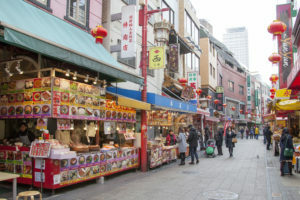 You can enjoy lots of stands to sell Dim sum, sweets and Chinese food stuff on the street. Hello! Welcome to Kobe, Japan. We arae Kobe sightseeing supporters for handicapped people. 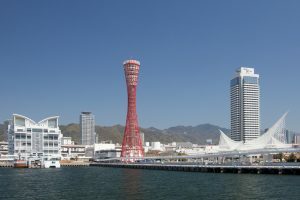 Kobe is in Kansai, the west part of Japan. 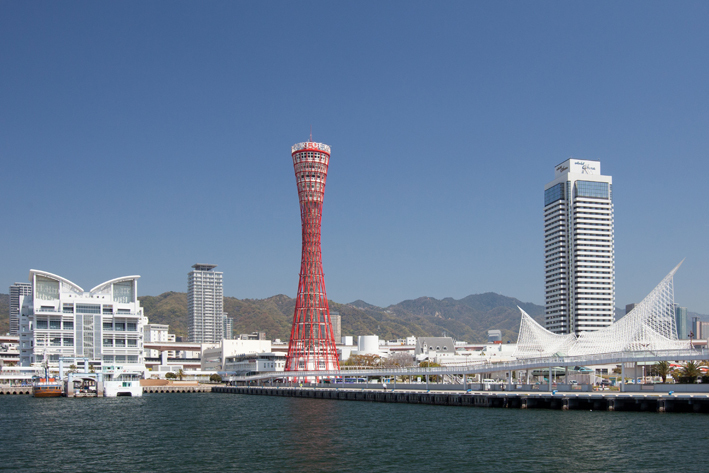 It is one of the most beautiful port city which located in front of Rokko mountains and faced to Seto Inland Sea. You can enjoy the beauty both mountains and sea. 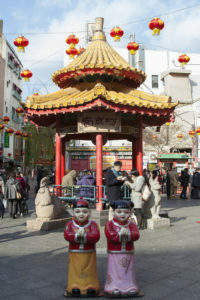 It has an old history and its unique culture of exotic mixture with foreign people. 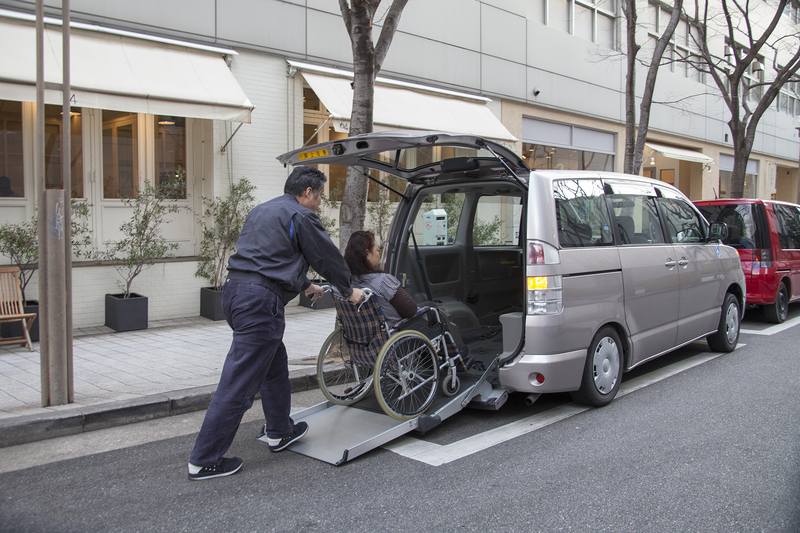 Kaigo taxi is a special taxi which is available to use with wheelchairs. 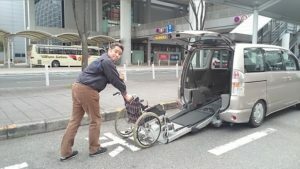 If you are anxious to use public transportation with wheelchairs, we are ready to go on any purpose. We are professional drivers who have licenses of nursing and a project licence of Ministry of Transport. People who need help with wheelchairs and stretchers may use our service. 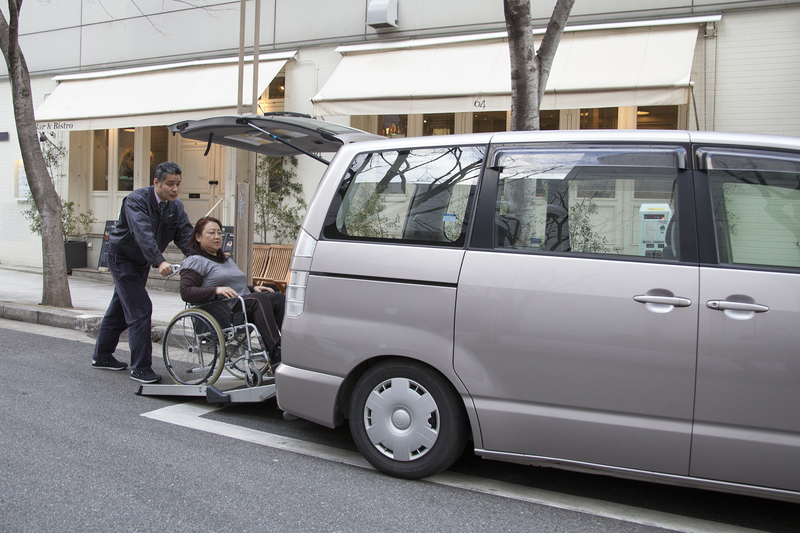 Our vehicles have special equipment like lifts and slops to get in and out with sittig wheelchairs and laying stretchers. All services are needed reservations.